Home Crepe Blog Sizzling Summer’s Here! Spring has sprung – the flowers and new romances are now in full bloom, and we’re headed into the hot, hazy days of summer. June is all about patio lunches, afternoon bike rides and evening strolls through the park – its time to get outdoors and celebrate nature! Read on for just a few of the different ways you can do your part to help the environment and our planet over the next month. Last month we celebrated Mom… well now it’s Dad’s turn. The third Sunday in June marks the day that we celebrate our fathers and show them our appreciation – this year it falls on June 17th, so mark your calendars! This year, Canadian Environment Week takes place from June 3-9. The whole week is dedicated to protecting Canada’s natural environment, and there are several cool things sandwiched in. Take a few minutes to read on, and think about what you can do to protect the natural environment! The week-long Commuter Challenge is a national, friendly competition among organizations and cities to see who can get the biggest percentage of employees out of their cars, and into using healthier, cleaner ways of travelling such as walking, cycling, carpooling or public transit. June 5 is World Environment Day – in 1972, the United Nations designated this as a special day in order to stimulate activities to help save the environment. Clean Air Day on June 6 is a chance for Canadians to show their commitment to making the air cleaner by learning about air pollution and participating in activities that contribute to cleaner air – ride your bike! And finally, June 8 is World Oceans Day. The Government of Canada introduced the idea of a special “oceans” day in 1992 at the Earth Summit in Rio de Janeiro, and ever since, it has been celebrated around the world. Think about the important role of oceans to our planet, and help raise awareness! 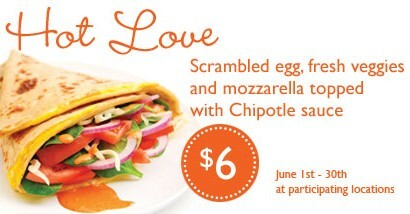 This month’s scrumptious Crepe Delicious feature is perfect for the season: a Hot Love crepe. Treat that special someone (this month, probably your Dad or your new summer romance!) to this spicy number. Scrambled eggs, fresh veggies and mozzarella, all wrapped in our signature crepe and drizzled with our special hot sauce. Perfect for brunch or anytime!